← Restricting access to particular features on the iPad. Reflection.app has provided an alternative to using Apple TV to mirror your iPad or iPhone. Reflection allows you to mirror your iPhone 4S, iPad 2 or iPad 3 to any Mac running OS X 10.6+, wirelessly. Previsouly I had been looking to purchase Apple TV to utilise the AirPlay function of the iPads within the classroom. The ability to wirelessly share the iPad screen with my MacBook linked to a projector allows me or the students to share the iPad screen with the whole class from anywhere in the class or anywhere on the school premises. As long as I the device is connected to the same WiFi network as the Mac running OS X 10.6+ then the mirroring will work. 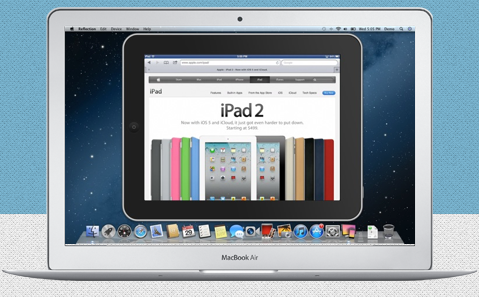 Reflection also allows you to easily demo iOS apps on any Mac running OS X Lion using AirPlay Mirroring on iOS 5. Mirroring and recording the MacBook screen using Camstasia allows you to make instructional videos that can be shared with students or the students could produce their own to demonstrate to their peers. This is one option that I will be exploring with my Digital Leaders. Follow their progress and excellent advice at @PCSADigiLeaders. Reflection currently cost $14.99 (approx £10) for an individual licence or $49.99 (approx £40) for 5 licences. This is a lot cheaper than forking out £100 for Apple TV + £40 VGA to HDMI convertor to allow this to work in the classroom with a projector that doesn’t have a HDMI input. Check out my first attempt of a iPad Screencast. More to follow! Posted on April 10, 2012, in Apps, elearning, General, iPad, iPhone and tagged apple, apple tv, apps, camstasia, gadgets, mobile devices, mobile technology, smart phones, teaching, technology. Bookmark the permalink. 1 Comment.